Then imagine them systematically probing over 200 major artists and over 1000 masterclass listings over four years - and being able to choose those classes most relevant their training! 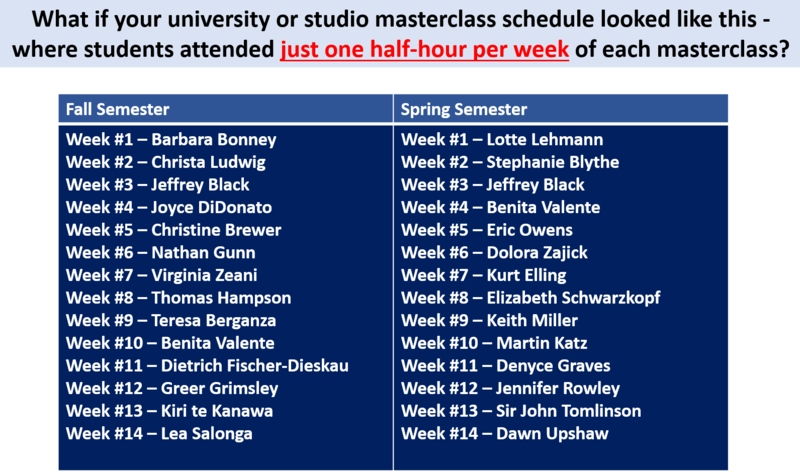 The Vocal Masterclassics Advantage Curriculum is a systematic program whereby students view approximately 14 hours of "guided-choice" masterclasses per year in one-half-hour-per-week segments, totaling approximately 56 hours of world-class artist masterclass exposure by the end of four years of study. Requiring ZERO teacher preparation...each week, students access one of the 40 VMAC Assignment Forms corresponding to the semester and week of the semester in which they are studying. Utilizing the Vocal Masterclassics nine drop-down search menus, students complete assignments that directly apply to the training, repertoire, genres, and performance skills they are encountering in their lessons. Click ﻿﻿﻿HERE﻿ ﻿﻿to read sample Advantage Curriculum Student Reflections. As students encounter personally-relevant masterclasses each and every week through the Advantage Curriculum, the self and integrative learning is powerful, on-going, and becomes contagious!